Knoxville&apos;s very own wildlife sanctuary just minutes from downtown, Ijams provides more than 300-acres of beautiful, gently sloping woodlands flowing southward from the Tennessee River and contains an array of habitats and exhibits, a museum store, miles of natural trails, the Navitat Canopy Adventure, a climbing crag, and access to a quarry lake and the river for paddling and fishing activities. Ijams also encompasses Ross Marble Quarry and Mead’s Quarry Lake, remnants of Knoxville’s history featuring unique natural elements. 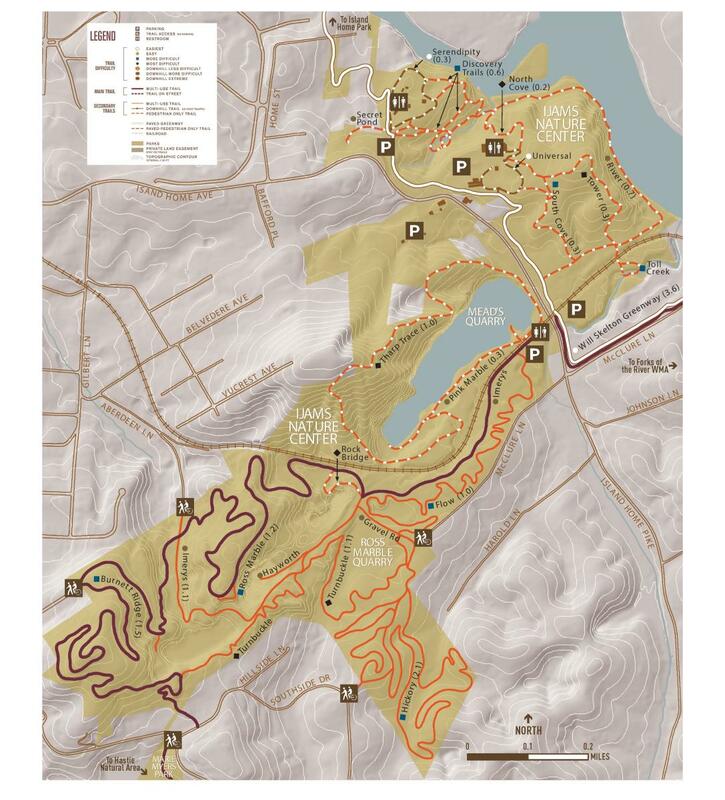 The paved Will Skelton Greenway connects Ijams to Forks of the River Wildlife Management Area, and the Quarry trails connect Ijams to Marie Myers Park. Directions: Take I-40 to the James White Parkway and cross the river. Take the Sevier Ave/Hillwood Dr exit and turn left onto Sevier Ave which becomes Hillwood Dr. At the end of Hillwood, turn right onto Island Home Ave then take the first left to stay on Island Home Ave. Ijams will be approximately one mile ahead on the left. Directions: From Ijams, continue south on Island Home Ave which becomes Island Home Pike. After the railroad tracks, turn right into the parking area for the quarries and trails.